Team Gemstoneuniverse is proud to present super apex of the Gem Pyramid Peridots for its patrons. Presenting before you three new lots of Peridots from Burma, Pakistan and China! See the gorgeous lustre of every single gem and leverage the power of Uparatnas to get superior Gem Therapy Results. 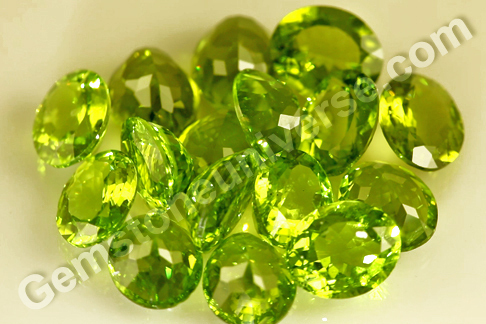 Amazing Burmese Peridots with the color of green olives complimented by excellent clarity and vitreous lustre! – Has the coveted color close to that of green olives. – Fantastic calibrated checkerboard cut. 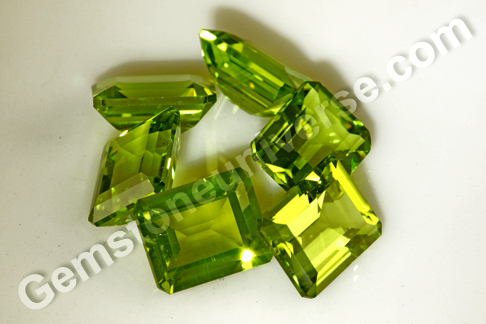 The checkerboard cut maximizes the play of light and gives each single peridot maximum lustre! 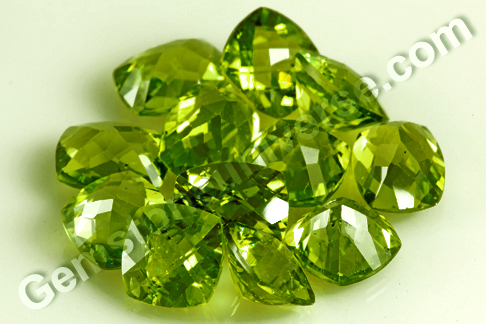 Vidya-The new Lot of Pakistani Peridots from Gemstoneuniverse is all about fine lustrous Natural peridot mined in Pakistan. These Peridots are characterized by a deeper richer, green — the shade of a luscious green apple to be precise, marked by flashes of gold. Beauty. Rarity. Flaunt value. Real Investment. Talisman power. This and much more is what you get when you get a gem from Gemstoneuniverse. Here you have the real advantage where you get world class expertise in sourcing the finest gems for you at a fraction of cost compared to elsewhere! At Gemstoneuniverse, quality, ethics, processes and the patron’s preferences are given the utmost attention and these are non-negotiable principles of functioning. We understand that Planetary Gemology is a discipline not too well understood in all its nuances by the general public, therefore simplifying and streamlining processes has been a major endeavour – from choosing a gem to delivery of your talisman, to give you a better and complete experience, free of hassles. We are proud of the value we bring to the quality of your life. Now here’s a stellar treat! A wonderful gem – a fully natural and unheated blue sapphire from the gem mines of Srilanka. At a superb jyotish weight of 3.87 carats, it’s the perfect gem for planetary gem therapy with rich silky cornflower blue color and amazing clarity. 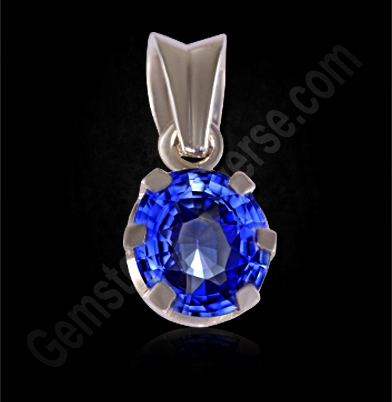 It is a marvellous piece with all the traits of a top-notch blue sapphire rolled into one. This magnificent one of a kind blue sapphire has been set in Sterling silver as a Saturn talisman.Natural blue sapphire or neelam gemstone is the gem of Lord Saturn and is used in a talisman to harness the energies of this planet. Individuals with Makar lagna and Kumbh lagna can wear the blue sapphire. Team Gemstoneuniverse is pleased to announce two new apps for Astrology Fans. 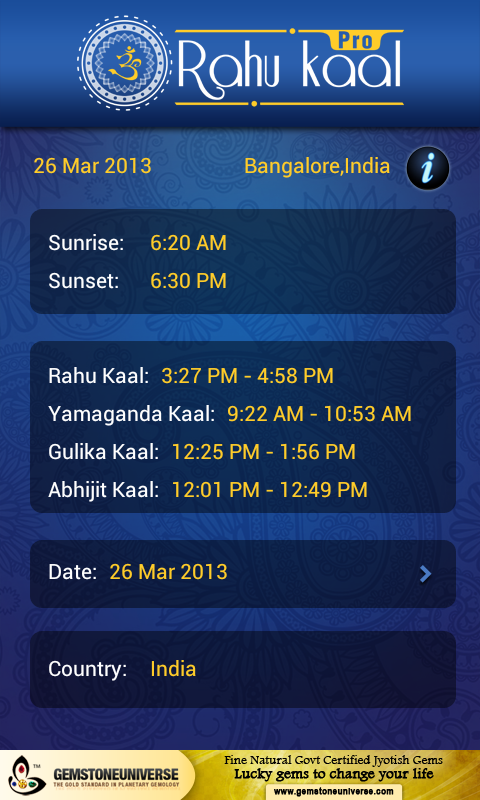 In continuing with our Be Your Own Astrologer Series- we announce the launch of Shubha Kaal Pro and Rahu Kaal Pro Apps. Segment 1 of the Shubha Kaal Pro contains Choghadiya Panchang which is based on the Vedic Hindu calendar. Chogadia is a system that divides the day into lucky and unlucky segments of the day. A system that is highly popular in Gujarat, it is now being recognized world wide for its accuracy and usefulness. Calculating Dina, Nakshatra, Tithi, Yoga,Karana for everyday, with automatic adjustment for any city in the world based on sunset and sunrise of every city in the world it calculates the most favourable chogadiya for commencing any important activity. It is advisable that all important work should be commenced during favourable choghadiya. There are totally seven types of Choghadiya. • Udveg, Kal and Rog are considered inauspicious. Segment 2 of the Shubha Kaal Pro contains the Rahu Kal calculator. 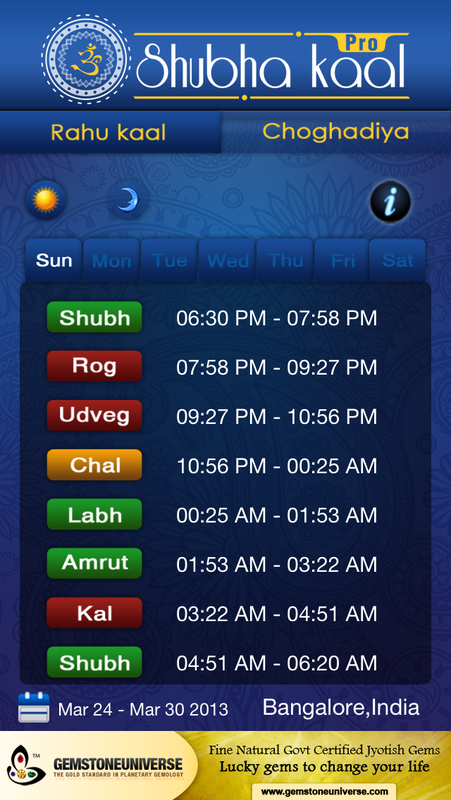 Rahu Kaal Pro is a multi-platform app, which provides the user with exact info about the auspicious/inauspicious time/ Rahu Kal for a certain day and location. As per the sacred tenets of Vedic Astrology, Rahu’s influence is a malefic/ negative influence. Rahu Kaal, also spelled as Rahu Kal, Rahu Kaal, Rahu Kala,Rahu Kalam and Rahu Kalaam occurs every day for approximate 1.5 hours . 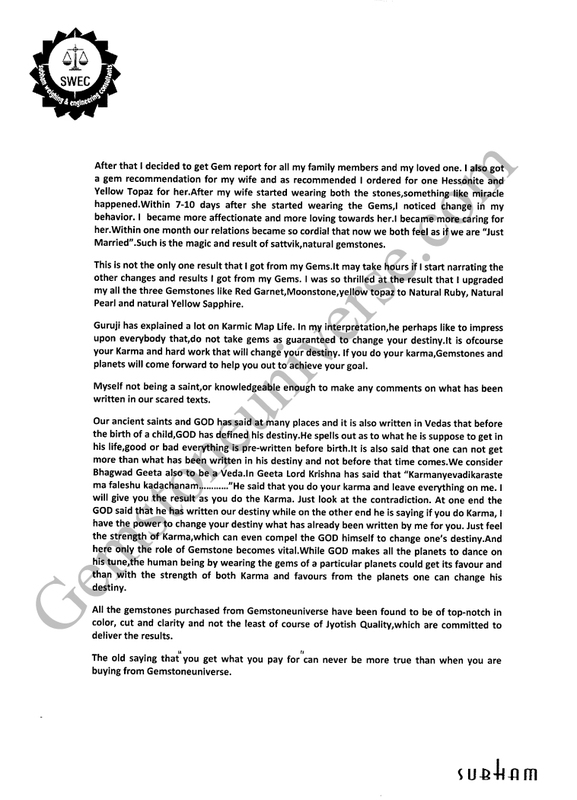 This period is classified as inauspicious as per Vedic Astrology and should be avoided for any major transactions, negotiations, starting of new work, performing holy deeds etc. However existing work and transactions should continue normally. 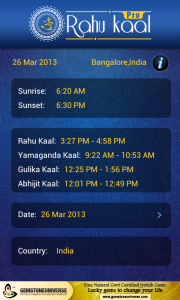 Rahu Kal timings and duration are not same for any two locations due to difference in local timings of sunrise and sunset. Even for one location Rahu Kaal timing and duration are not same for all days as sunrise and sunset timings keep changing through the year. Rahu Kal varies from place to place and differs for each location and each day. 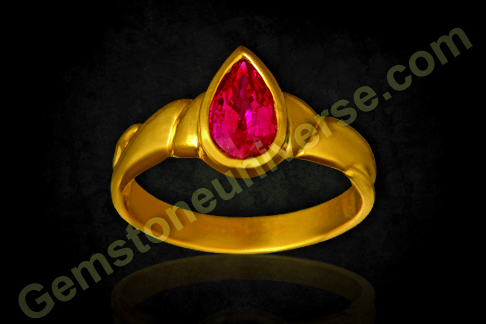 With this Gemstoneuniverse offering you shall get the most accurate time frame for Rahu Kal as per your geographical location. Enjoy the app and statistically evaluate if there is any impact by following these tenets and timings. It’s been a long time coming and we thank our dear patrons who waited so long and patiently to Get their Jyotish Quality Red Coral. Thank You for appreciating what we do! Moving on there is a shortage of fine organic treatment free coral globally specially with the Japanese Coral which is no where to be found. 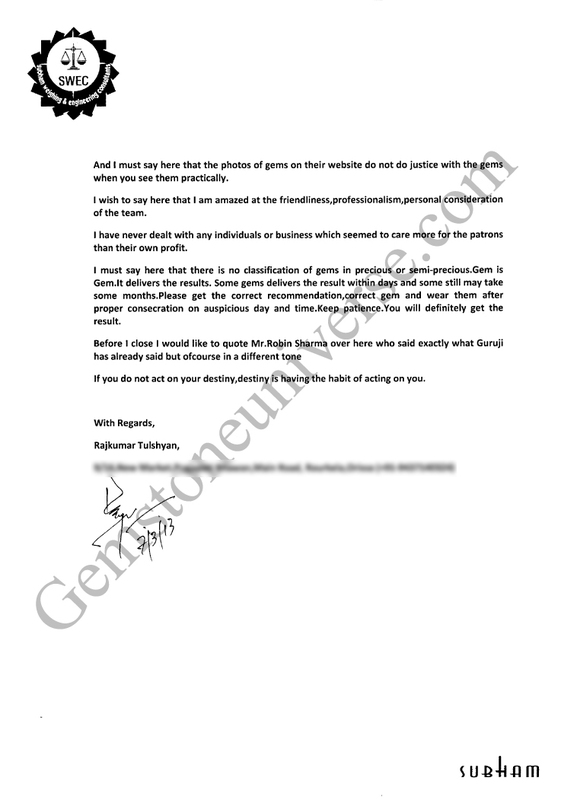 We did examine many lots but either they were not Jyotish quality or were in a price band where the cost of procurement is close to the selling price of the Red Coral on the Gemstoneuniverse website. 1) Fully Natural and Organic. Precious Biogenic material. 2) Full treatment free with no fillers, wax or dye. 3) Should be free from flaws as listed in the sacred texts. For example one of the flaws is known as Duranga (literally translated having two shades of color). A duranga coral destroys wealth and property. 4) Should have an even pleasing surface and attractive color. 5) Created in the sea by marine polyp. 6) AND SHOULD NOT BE A CAMEL BONE OR PLASTIC. More about that here. This Coral Lot fulfils all these criteria and is teeming with the Mars energies. Mars is the planet of health, vitality and courage and these essential elements are present in this lot. Aptly it has been christened- Kanti that means an inward flowing lustre. These Corals are from the Mediterranean Sea off the course of Sardinia, these today are benchmark since the supply of the Japanese Red Coral is nearly non existent. To understand that rarity of Organic Corals digest this fact- Coral Reefs live in just 0.1% of world’s ocean but they are the home of 25% of all marine species. 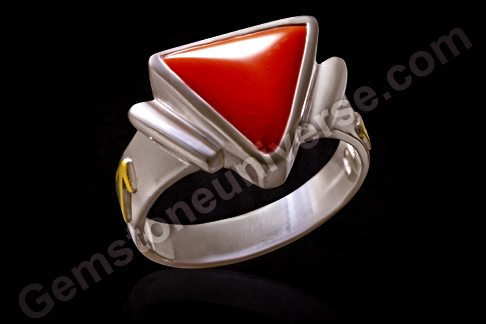 Featured today is a fine natural and organic Italian Red Coral of 4.75 carats set in sterling silver as a Mars Talisman ring. The natural Red Coral is a beautiful triangular cut, a smooth blemish free surface and has a robust Mediterranean ox blood color. Natural Red coral is an opaque gem of organic origin.The gem has been set as a planetary Bhasma ring, with the symbol of Mars set in relief on the shanks of the ring and the bhasma or the herbal ash sealed in the tubular channels that form a part of the design alongside the gem. The planetary herb used for Mars is Khadira/ khair. 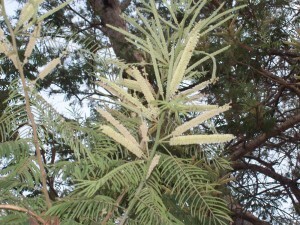 Its botanical name is Acacia catechu. The wood of the tree is said to have antibacterial, anti-fungal and anti-inflammatory properties. Sushruta, the ancient Indian authority on medicine has described it as an anti-obesity substance. 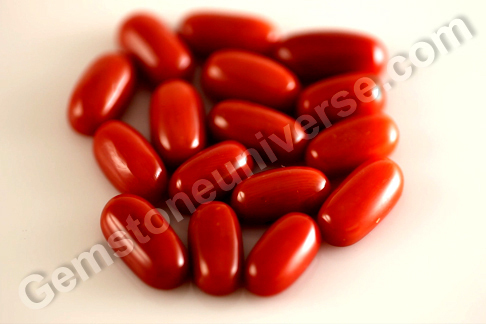 Natural red coral or Moonga is the gemstone of planet Mars also known as Angaraka, Kuja, Mangal etc. and is used to harness the energies of this valiant planet. Faith is something that is experienced based. First hand. If you have felt the way it feels, there’s a big chance that you will be at a loss for words explaining your experience. But when you have had a personal epiphany – it is life changing and may alter ways of thinking and functioning. 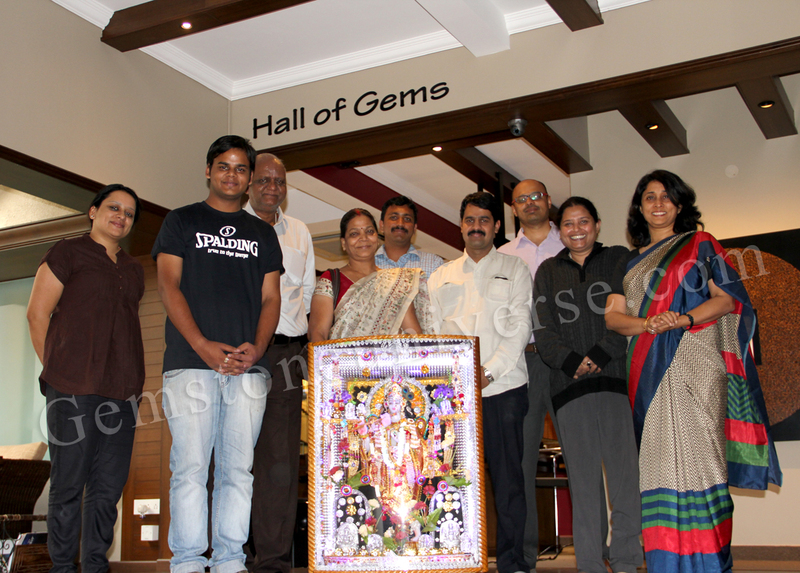 Here’s the video documenting the story Shri Rajkumar Tulshyan, who came all the way from Rourkela Orissa, just to meet the team at Gemstoneuniverse and share his experience after planetary gem therapy touched his life profoundly. His experience moved him in ways more than one. The endeavor – his traveling down to Bangalore in itself is remarkable. Also you can see the beautiful Shri Krishna vigraha that he presented to Gemstoneuniverse as offering for Guruji. And, we at Gemstoneuniverse are touched by the absolute honesty and fearlessness with which he unravels the complex fabric of his life and how he has found himself in a happier place, post his planetary gem therapy. 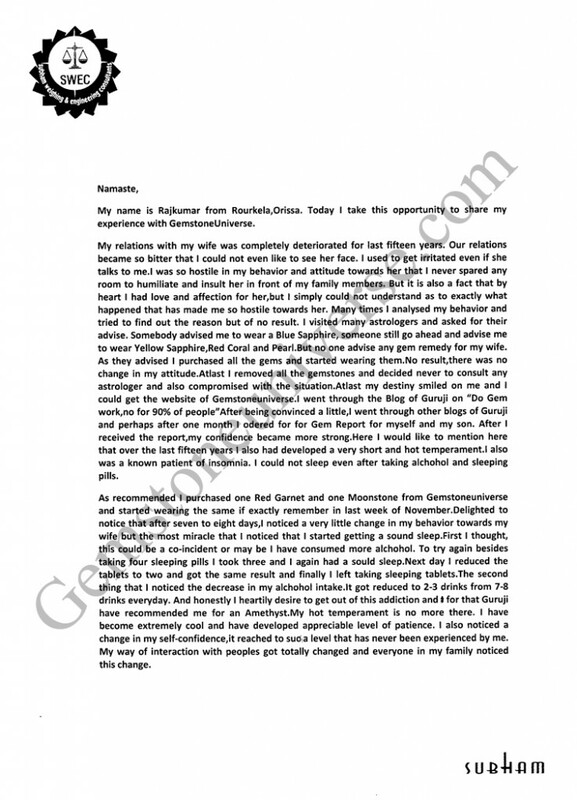 He has even documented his story in a letter and signed it. 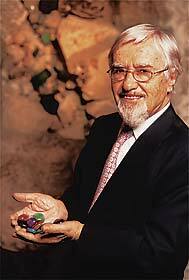 “It is my desire that maximum people should benefit from planetary gem therapy, the way I have been. And if telling my story can help someone make a wise choice, in ones own favor, so be it”, he says. 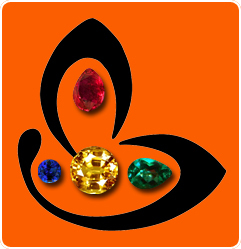 We do hope that the sincere efforts that we put in at Gemstoneuniverse and the value we bring to the table brings fruit to all and sundry who desire to have a qualitative shift in the experience of life. Dear Patrons we are pleased to announce that from now on we shall be providing you videos of all the nine precious Navaratna Gemstones. For best assessment of cut, color, clarity and carat weight we have used highly sophisticated equipment, lenses and a patent pending proprietary technology for capturing Gem images and videos for maximum magnification. 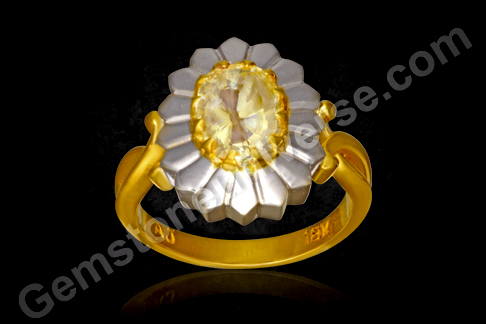 Some of these tools are available only with the best Gemologists and Gem Labs. In this highly magnified view you shall be able to observe the crystal minutely and will also be able to see inclusions that are not normally visible with the naked eye. Full 3 D circular view and custom white balance setting, read,-as observed in normal daylight. Enjoy the best of technology and sacred gemmology. No props, No LED’s, No flashing no gimmicks! The discipline of Vedic astrology has Lord Ganesha as its chief deity. Ganesha, the mystical elephant god, with the guileless form of a child, the complex symbolism that possibly holds the keys to unravelling life. The Cosmic Coder, who has scripted destinies and bestows the grace to read through the blueprint of life. The blueprint that is contained in the numbers and alphabets stringing themselves in a unique way for an individual in the triangles and quadrants of the birth chart. The form of Ganesha is extremely symbolic. Among his features, the most notable is the huge elephant head resting on the portly body of a young boy. Ganesha has the head of the elephant (the vehicle of Jupiter), symbolizing extreme intelligence, wisdom and the ability to stay unperturbed by the obstacles. 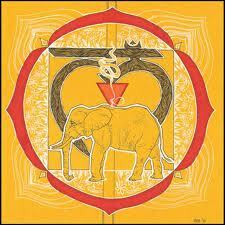 Ganesha’s head is also symbolic of the Pranava Om. 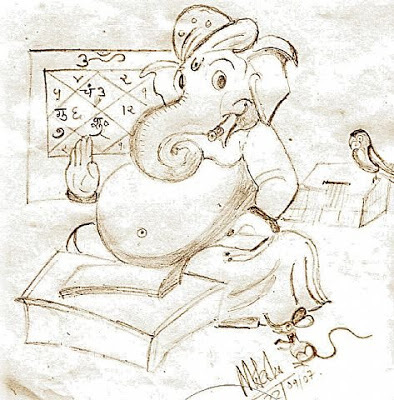 Ganesha rules over the panch bhootas – air, earth, water, ether and fire therefore his control over all life is absolute. The first offerings are therefore rightfully his. Ganesha is also known as Vighnaharta (the remover of obstacles). The divine powers of Jupiter symbolise the ability of charting one’s course with a level head despite difficulties. All it takes is the keen observance of the habits and way of life of this gentle giant and one can take many life lessons, including method of keeping tremendous power, fearlessness and force nestled quietly and being able to carry it with quiet grace. The story of Parvati (shakti) giving form to Ganesha and then him getting an elephant head after an enraged Shiva beheading him is not just a mythical tale. It is also a cryptic code where Ganesha, the guardian of the mooladhara chakra (shakti in her rawest form), is annihilated by Shiva (crown chakra). The mooladhara can be harmonized when the impulsive energies of its guardian are internalized along with the wisdom, that is signified by the elephant head i.e Jupiter energies. That is when the Jupiter enables the rise of the Kundalini Shakti after the syncronization of chakras has been affected by imbibing of wisdom. The fascination with gemstones, especially where royalty is concerned is well known. True that it does require green-backed muscle apart from connoisseurship to possess these treasures of the earth, a passion for color and a seeking for miracle are two other invaluable ingredients of this pursuit. Here’s the lovely Duchess of Cambridge – Kate Middleton, sporting fantastic diamond and ruby jewelry. There is also the close up shot of the fine rubies adding that not-to-be-ignored dash of color, to the ensemble. The Jewelry is said to be one of her wedding presents. Do take note that several small rubies have been set together to get the effect. In the market for natural rubies, a single ruby of over 1.5 carats is extremely valuable. And the price shoots through the roof if the origin is Burma. The trade circles believe that a natural, treatment free ruby measuring well on the 4 C’s is a PRIZE! Rubies have outdone diamonds many times in terms of price per carat value. It is no wonder that finest collectors look out for rubies all the time. Of the many origins of the fascinating emeralds, Brazil finds a mention too. Infact, it is one of the world’s major producers of natural emerald, besides being the producer the largest varieties of colored gemstones in the world, nearly 90 in number! It is a vast nation with a rich tapestry of geographical factors that have contributed to its natural wealth. The discovery of emeralds in Brazil though was a fairly late occurrence as recent as early 1960’s. Even then, it was a struggle for this gem to find recognition as a true precious gem as enjoyed by its peers from Colombia and Zambia. In 1963, Jules Sauer, the renowned owner of Amsterdam Sauer and gem dealer, found beryl in Salininha in Brazil’s Bahia State. As far back in time as reckoning went, the world of gemstones knew and categorised “emerald” as green beryl colored by the trace element chromium. The problem arose because the Brazil Bahia emerald were colored by both vanadium and chromium more of its color coming from vanadium. It was only when he submitted specimens to Gemological Institute of America (GIA) gem lab and obtained its identification and certification as precious emerald, did the world sit up and take notice of the Brazilian emerald. The Brazilian emerald is remarkable with its vivacious rich green color. 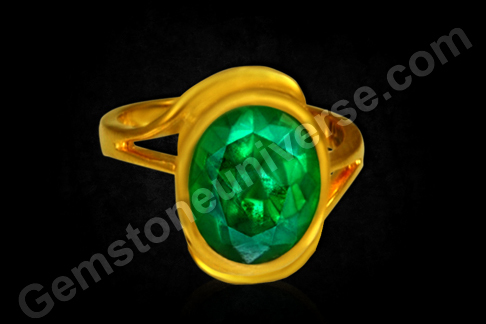 In the good quality, brazil emerald it is easy to notice the innate glow of the gem, which adds a lot to its value. Most of the Brazil emerald comes from the state gem state of Minas Gerias. The forms of mining vary from the almost primitive ways of men going down mining shafts in a leather harness, to the state of the art machines operating at the surface level. Most of the emerald occurs here in mica, biotite and talc schists.